It was all water-cooled after this. It was the end of an era. A new beginning was about to start, but Porsche had one last trick up its sleeve as it bade farewell to the air-cooled 911. We’re talking about the 993 911 GT2, the turbocharged and rear-wheel-drive ancestor to today’s GT2 RS. Coming to RM Auction’s September event in London is this 1996 911 GT2, one of just 161 street legal examples built. Its first and only owner so far, however, didn’t drive it all that much, which explains its mere 11,185 miles. 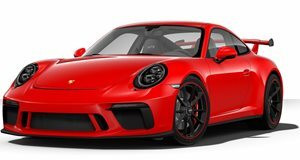 So why did Porsche decide to do the GT2 in the first place? Because all-wheel drive was banned in most rally competition sanctioning bodies by the mid-1990s, thanks to the Audi Quattro and Nissan Skyline killing it out there. Porsche, meanwhile, had an AWD 911 Turbo, and figured why not just keep the turbo and revert back to RWD. The result was 430 hp going directly to the rear wheels through a six-speed manual transmission. Not only did RWD change the car’s character, but it also reduced weight, a factor that instantly made the 911 GT2 competitive. And because of those all too familiar homologation rules, Porsche had to build a road going version. These GT2s achieved higher boost than the standard Turbos. They also shared cutaway fenders with the Carrera RS as well as removable and replaceable bolt-on flared arches. These were needed in order to fit the wider racing wheels. You’ll also notice the car’s badging simply says "GT," which is what is was originally called. This particular 911 GT2 is black on black, and even has a/c and electric windows. It also comes with the original owner’s manual. Interestingly, it was involved in a crash at the Nurburgring in 1999, but was sent immediately to Porsche for as-new repairs. RM Auctions estimates it’ll go for between 675,000 GBP and 750,000 GBP, or roughly $875,000 to $972,000, but we think it could easily hit the million dollar mark. Photos courtesy of RM Auctions.